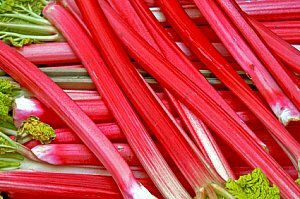 Rhubarb facts, an information sheet for kids cooking activities. Rhubarb facts and general information about rhubarb. Rhubarb grows on a plant. It is a perennial which means it keeps growing year after year. Rhubarb plants look like deep red celery. They should be thick and crisp with a deep red color. Rhubarb is cooked with sugar because of its tart acidic taste. It is used in pies, jams, and fruit desserts. Rhubarb has potassium and a small amount of Vitamin C.
In mixing bowl, add sugar and flour. Add rhubarb and stir together. Prepare pie crust in pie plate. Pour rhubarb mixture into pie crust. Top with butter. Cover with top crust and add slits. Bake at 425 degrees for 50 minutes or until crust is golden and pie is bubbly. Cook the rhubarb in water with sugar and make custard or pudding (From a packet) It is nice also with a pinch of salt. Back to Food Facts from Rhubarb Facts.